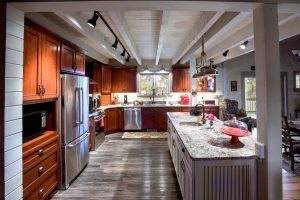 When planning your custom home—whether it’s in North Carolina, South Carolina or Georgia—it’s important to pay attention to good design ideas that add value as well as those that meet your own personal needs. Based on our research, we’ve collected the 6 best design features that will enhance your home and add potential appeal to future buyers. Single floor living is a great benefit, especially for couples as they mature. Even able-bodied adults can be subject to a knee or hip surgery and removing stairs from the equation can make life easier during recovery. Additional bedrooms can be situated on an upper floor, but one-floor access is definitely a preferred feature. When planning the first-floor master, you’ll want to ensure some separation if possible from the main living areas and adjacent first-floor laundry to keep everything as private and convenient as possible. Expanded attention is also focused on the master bath or “en suite” in designer shorthand. 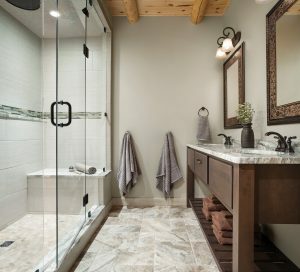 Many Katahdin Cedar Log Homes now have master bathrooms designed to create a spa-like atmosphere, adding to the sanctuary of the master suite. Some of the most popular features for masters include double-sink vanities, spa tubs, and large custom showers. If you don’t desire a tub, just make sure that your shower is oversized and beautifully designed with tile or stonework and frameless glass enclosures for timeless appeal. Also, if your master bath will not have a tub, it is a great idea to have one in another bathroom! With the kitchen playing a central role in many new homes, an expansive kitchen island allows family and guests to gather and offers additional casual seating. Keep your island a manageable size relative to the rest of your kitchen so that it doesn’t overwhelm the room and allows for easy movement when appliance doors are open. Concepts for kitchen islands can range from functional “waterfall” sides to repurposed furniture that provides ample storage and visual appeal. Granite, quartz, slate or composite counters can add impact and functionality to the island and don’t necessarily need to match other kitchen counter materials. An oversized, deep sink will add to the utility of the island in food prep and clean-up. Many homeowners also locate the dishwasher in the island for easy rinsing and loading. Between grilling in the summer and fire pits in the winter, outdoor spaces for entertaining can expand living area your new Asheville, NC home when you’ve got a houseful for the weekend. Imagine enjoying mountain vistas, rolling hills, or lake views from your beautiful outdoor decks and broad covered porches, which also add form and function to make the transition between inside and outside easy. If you’re considering a porch, make sure it’s broad enough to accommodate seating. A narrow porch or deck adds costs without much functionality. If summer outdoor entertaining is your main focus, consider adding a screened area on part of your deck or porch. That will keep insects from interfering in the fun! 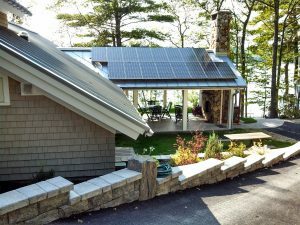 If you’ve ever considered including solar power in your new custom home, 2019 is the last year the 30 percent Federal tax credit for residential photovoltaic solar arrays will be available. Tax deduction rates step down beginning in 2020. While the optimal location is on the roof, ground mount arrays can also overcome challenges for southerly orientation or shade. Solar panels are more sleek and powerful than ever, with high-performance panels producing power well into 30 or more years. Add a storage battery and you’ll never worry about power outages during storms again! Your new home will incorporate many energy efficient features, including improved insulation, double- or triple-glazed windows and thermally insulated doors. Ensuring that your savings continue, adding a high-quality HVAC system only makes sense. 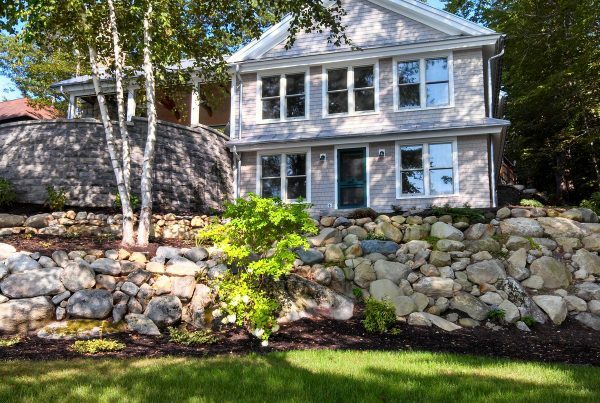 Opting for high-efficiency heat pumps—powered by your local utility and offset by your brand-new solar array—can provide heating and cooling for a fraction of the cost of older systems. If you’re unsure of the best options, we have a lot of solutions that can save energy and money. Ventilation is another area where innovation has played a role. Because today’s efficient homes are very well sealed, proper ventilation is important for healthy air inside. To cope with fluctuating humidity levels in North Carolina and South Carolina, we recommend installing a ventilation system that will remove stale air from the home and draw in fresh air, while controlling humidity. These systems are designed specifically to your individual home and its specific need for air exchange based on its air tightness. 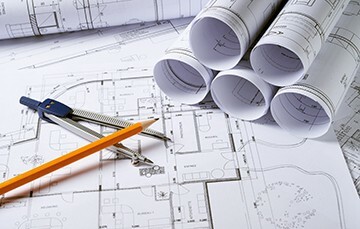 Still, have questions about what design features to include in your Hendersonville NC custom home? Give us a call at 833- 244-8944 and we’ll be glad to help you narrow down the options.